Above "Cricket, lovely cricket." An England batsman hits out during a Test Match against the West Indies. The Londoner can see many of the major national and international sporting events in his own city. Association football - soccer - has a huge following. Every Saturday, and certain evenings in the week, crowds are on the move towards a stadium or football ground. They often wear the colours of their team in a scarf, hat or rosette, and carry a rattle. The interest becomes more intense as the football season moves towards the FA Cup Final at Wembley Stadium in May. This is the major event in the football year. Tickets for a place at Wembley are sold at a premium. London has a great many local football teams with staunch support from local people - West Ham, Chelsea, Arsenal, Queen's Park Rangers, Fulham. Football fans engage in tribal warfare. The fans travel hundreds of miles to watch their teams play away. In the excitement dangerous confrontations sometimes occur, bringing in the police. Certain precautions, including safety barriers, have been introduced in recent years to separate hooligans from real fans. When top London teams are playing at home, fans travel not only across London, but from as far away as Germany and Italy, where the interest in soccer is just as great. Football is the top sport in England, and makes heroes of players. Those at the top can enjoy a very lucrative career. Small boys at school emulate their favourite stars, and their fathers remember the days of Stanley Matthews. The game is becoming more sophisticated every year, and the competition fiercer. The centre of London is not the place to be during an international match, or a match between England and Scotland. Fans pour into the capital in their thousands the night before. The hotels are packed, the streets overrun and fuller than ever. The evening after the match is a time to stay at home. The fans of the winning side are out to celebrate. The police are kept busy with those who have taken the celebrations too far. The oldest of all international tennis events, the famous Wimbledon tennis fortnight, is the most reported sports occasion in London. The Wimbledon Lawn Tennis Championships are world renowned and the biggest event of the year for all international tennis players. The Lawn Tennis Championships started at Wimbledon in 1875, soon after the game was invented, when the players were exclusively upper class. Its championship titles are the more treasured in the game, even if the prizes are not the greatest in money terms. The stands are always full to capacity. Many people travel halfway across the world to see it. Through extensive television coverage a vast public follows the event each year. For a sport that was virtually unknown twenty years ago, show-jumping has a big following. The first International Horse Show, held in London in Olympia in 1907, had only a secondary place for show-jumping. In 1957, the White City stadium became the venue of the International Horse Show. This was mainly instrumental in the acceptance of show-jumping by the general public. Since then, the Horse of the Year Show at Wembley stadium has become a major annual event. Television, again, has brought this to homes which would normally have no interest in horses or their riders. Apart from soccer, there is another type of football extremely popular in Britain - rugby. It, too, has important occasions in London, notably at Twickenham. The Rugby Football Union stages many big events at Twickenham, the home of the Middlesex Sevens and the English international matches against Ireland, France, Wales and Scotland. Here, too, is played the famous "Varsity Match", between the two oldest universities, Oxford and Cambridge. Twickenham is also the home for matches against such famous teams as the All Blacks of New Zealand. Soccer and rugby are quite different games, and have their own separate followings. Still the most gentlemanly game played by the English is cricket. 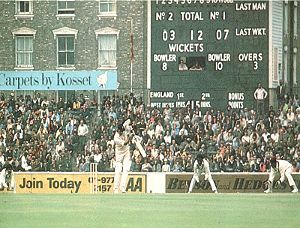 Test matches, the international matches played between England and Australia, India, Pakistan and the West Indies, are held in London during the summer. Lords, the ground of the Marylebone Cricket Club [the governing body for British Cricket] stages a Test match in June. The Oval, the Surrey ground, puts on a Test match in August.